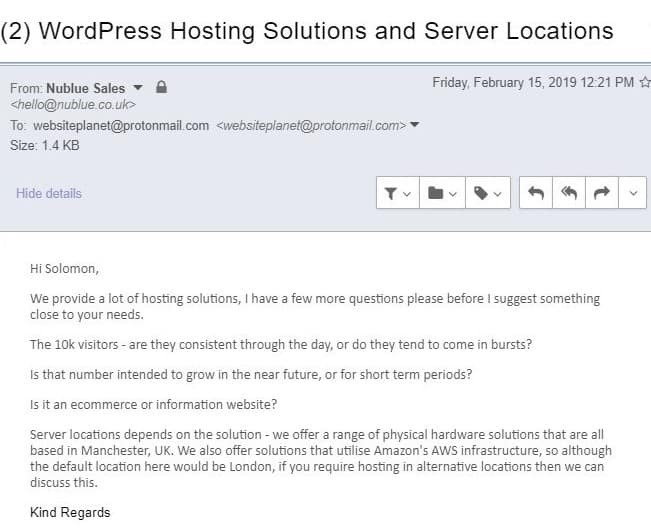 Nublue Review 2019: Is Nublue a Good Hosting? Established in 2005, Nublue is a web hosting provider based in the United Kingdom. The vendor is an expert in providing Magento solutions. It also provides an array of unmanaged hosting services including virtual, dedicated, and AWS cloud server solutions. Nublue is a Magento hosting provider based in the U.K. This vendor was established in 2005 and has over 10 years experience in e-commerce web design and development. Its hosting solutions also include cloud servers, dedicated and virtual servers, domain name registration, and SSL certificates. Nublue offers enterprise-grade SSD storage and Nginx caching optimization so that its UMI, CMS websites can load fast on its hosting platform. This vendor keeps track of and manages its hardware to ensure that your website is not impacted negatively by customers that are overusing its servers. It runs audits and makes recommendations to users on how to better run their websites without experiencing avoidable downtime. Nublue uses advanced migration and upgrading techniques that minimize downtime and disruptions. What’s more, you can receive post-migration care to essentially ease an otherwise complex migration process. The vendor’s hosting solutions come with Plesk Onyx control panel and Installatron one-click installer for over 400 apps. Nublue offers its customers Magento patching services where its experts check your Magento patch status and then advise you on which ones you have missing. Users also have the option to allow the vendor’s specialists to apply the missing patches. This company offers multiple backup options leaving users with little to worry about. The backups provided by this hosting firm include: on-demand downloadable backups and cloud backup options to Google Drive, OneDrive, AWS, or FTP with backup scheduling. Even better, Nublue’s control panel enables clients to generate and download website backups for maximum safety of website data. The vendor also offers automated Acronis offsite cloud backups to further give you peace of mind as far as your website data is concerned. Nublue’s hosting solutions are reasonably priced. The vendor has a monthly billing cycle and prices of its hosting plans are listed in euros. This hosting provider has simplified the process of upgrading and downgrading hosting plans so that interested clients can move from the basic starter plan all the way to the premium hosting plans with ease. Nublue offers a 30-day money-back guarantee and has a network uptime guarantee of 100%, backed by a compensation plan; the vendor promises to credit your account with 10% of your monthly fee for every 30 minutes of downtime. All its hosting plans include a free Let’s Encrypt SSL certificate. To get in touch with the Nublue technical support team, the vendor has availed three options: livechat, email, and telephone support, but no ticketing system. The support team is not available 24/7 and is perhaps the reason why the vendor has an average response time; I sent them an email and received a response almost 24 hours later. In addition, the Nublue website has a carefully crafted and fairly detailed knowledge base. For customers looking for Magento e-commerce solutions, Nublue would be a good fit. The vendor seems to have invested quite heavily in its hosting infrastructure and expertise to deliver reliable, time-tested hosting solutions for businesses in the U.K. and other countries across the globe. Buy Magento hosting from Nublue! Wondering how Nublue stacks up against other Web Hosting companies? Enter any other Web Hosting company and we will give you a side-by-side comparison.